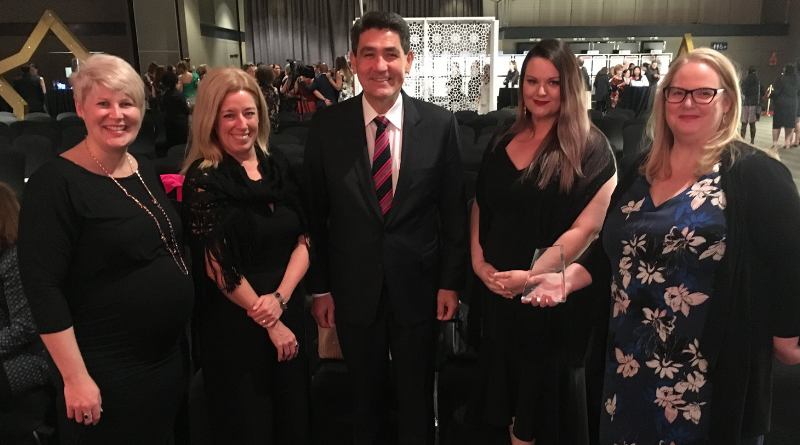 The Westmead Redevelopment project team celebrated a win and finalist award at the Western Sydney Local Health District Quality Awards at Rosehill Gardens on September 13. The project team was a joint winner for the Research and Innovation category for the submission 6S success! A Westmead Redevelopment lean storeroom initiative. To-date, 36 storerooms have been transformed across 14 services resulting in more than $97,000 worth of stock reallocated and/or disposed of and $230,000 in productivity savings annually. The joint winner of the category was the team behind the pharmaceutical supply chain initiative. The project team also scooped up a finalist award in the Patients as Partners category with its submission How consumers are transforming the design of the new central acute services building. The submission demonstrated how consumer and community engagement is embedded with the design, governance and evaluation methodology implemented by the Westmead Redevelopment project team. Westmead Redevelopment director of redesign and transformation Carla Edwards said it was a thrill to be acknowledged at such a prestigious ceremony and to join other nominees from Western Sydney Local Health District. “This shared win and finalist award is a big pat on the back for our team, partners, consumers, community members plus the many staff we work with across the Westmead precinct,” Carla said. “The storeroom clean-ups have been a great opportunity for us to work side-by-side with staff at Westmead Hospital, The Children’s Hospital at Westmead and the team at Baxter who have been generous with their time and contribution to the program. Carla thanked the Westmead Redevelopment consumers who volunteer their time through countless meetings, workshops, visits to other health facilities and through online feedback including surveys. She also acknowledged the thousands of community members, who have contributed their ideas which have shaped the designs of the new hospital building. Read summaries of the 2018 Quality Award finalists and winners.